The New York Times wisely runs a full page of op-eds today on the impact of high gas prices, "Is Your Tank Half Empty or Half Full? ", but none deals with the biggest problem introduced by telecommuting: How to really work effectively at a distance. The Times is not alone in headlining telecommuting (well, in truth, only one piece in today's paper, "Pajama Life" by Nicole Benson Goluboff, actually even touches on this). I've seen dozens of articles about the sudden move to telecommuting in the past few weeks, dozens. Having covered this topic in rather excruciating detail over many years, let me leave it at this for now: Our old slogan, "90% people, 10% technology," remains true. It's not about bandwidth, whiz-bang software, or mobile devices. The magic is in the sociology. 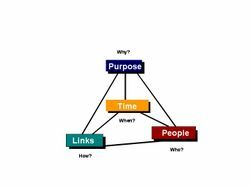 Keep four things in mind, correct as necessary, and your telecommuting will work just fine: People, Purpose, Links, and Time.